Islander and her college roommate, Monica C., from Taiwan used to cook together when the cafeteria was closed during the university holidays. With limited resources in the dorm kitchen, they could only make simple meals. 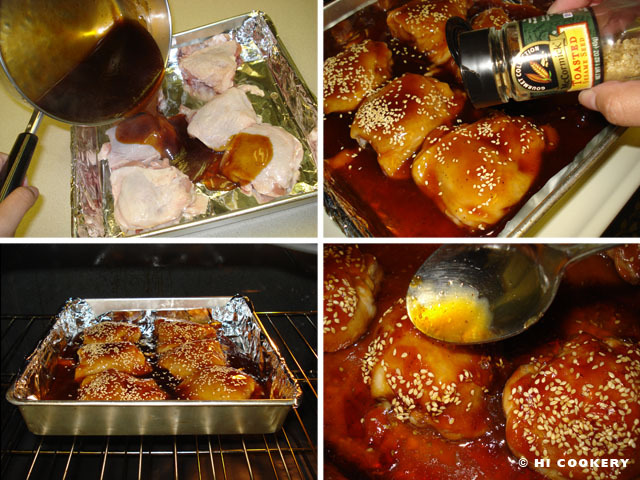 Baked teriyaki chicken was their “go-to dish” as it was delicious to eat with the plain white rice that was cooked in their shared steamer—and it was easy to prepare for inexperienced chefs! Several years have passed since graduation but Islander still bakes teriyaki chicken when she is lazy or tired but hungry for something substantial (and nostalgic). The source of the recipe is not known but it reminds Islander of her college cooking days with her roommate with whom she still keeps in touch. 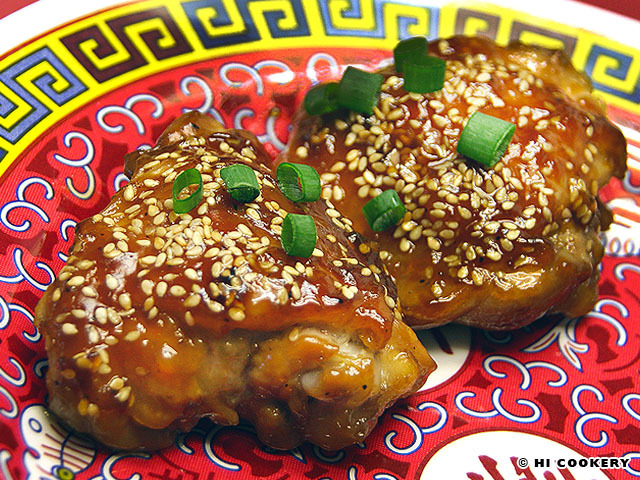 For National Chicken Month, make mealtime memorable with baked teriyaki chicken. In a foil-lined pan, arrange the chicken thighs. In a saucepan, combine the pineapple juice, corn starch, sugar, garlic, black pepper, soy suace, vinegar and ginger. Whisk until mixed well. Stir over medium high heat until thickened. Pour the sauce over the chicken. Sprinkle with sesame seeds. Bake in a preheated oven at 400 degrees F for 45 minutes. Remove from the oven, reserving some of the sauce to serve with the chicken. Garnish with green onions. 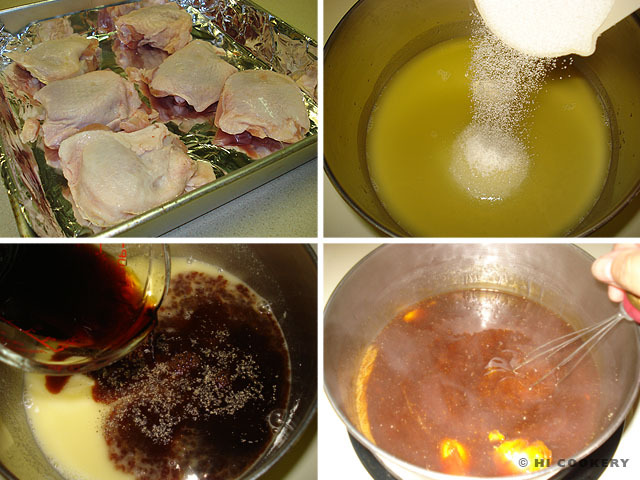 When Islander and Monica C. did not have access to a stove top (like when other dorm residents were using it), they improvised and just microwaved the teriyaki sauce ingredients until thickened (about 3-5 minutes) then poured it over the chicken before baking. ‘Tis the season for…tailgating? In Hawaii, where the “winter” weather is warm, football fans gather for game day grilling between late December until January. Before statehood in 1959, locals and tourists would tailgate at the old Honolulu Stadium or War Memorial Stadium and now at the Aloha Stadium. Football games were played at the Poi Bowl (1936-1939), Pineapple Bowl (1940-1952), Hula Bowl (1947-2008), Aloha Bowl (1982-2000), Oahu Bowl (1998-2008) and Hawaii Bowl (2002-current). The Pro Bowl took place in Hawaii (1980-2009) but was played in Florida for the first time in 2010. In 2011, the Pro Bowl returned to Hawaii and people want it to stay at the Aloha Stadium (it is scheduled for 2012). We know some of our friends back in Hawaii who like to grill teriyaki burgers when tailgating at the Pro Bowl. Highlander just watches the game on television on the mainland. 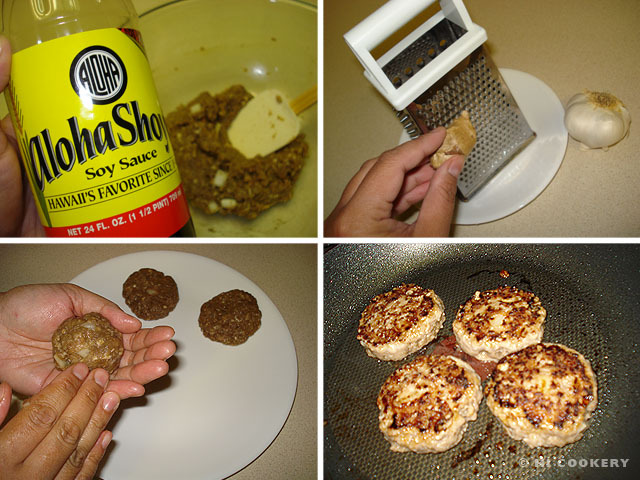 But we still make festive football food at home, such as mini hamburgers with a sweet soy sauce. Teriyaki sliders are terrific for tailgating, super when watching bowl games and perfect for observing National Hamburger Day! 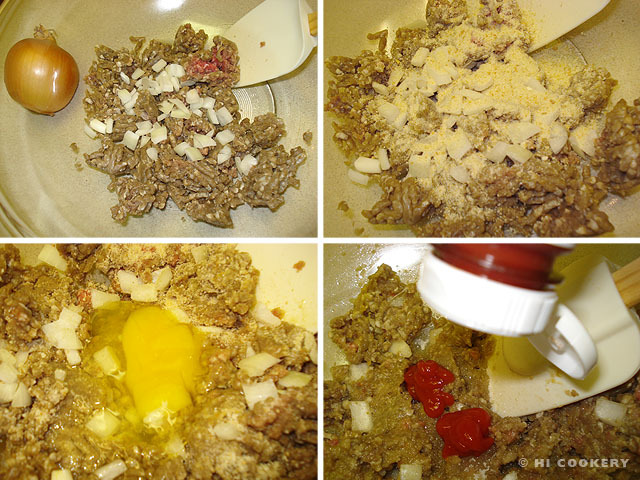 In a large mixing bowl, crumble the ground beef with the onions. Season with the salt. Mix in the bread crumbs. Bind with the egg. Add the ketchup. Mix in the soy sauce, sugar and garlic. Grate the ginger and add it to the ground beef. Shape into small patties. Grill or fry until cooked through. Yield: 8 patties per half pound of ground beef. 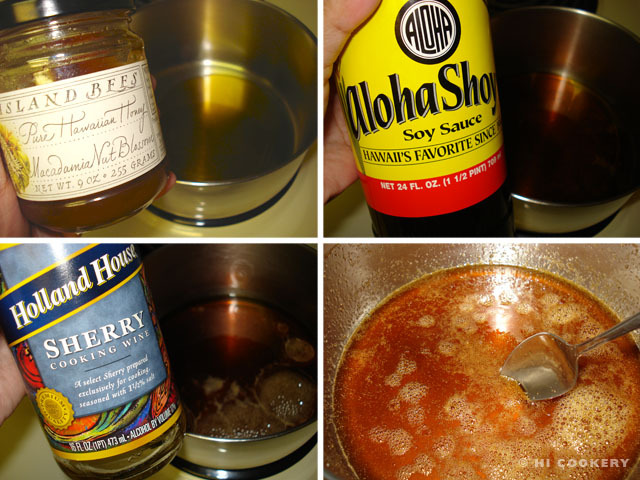 In a small saucepan, combine the honey, soy sauce and sherry. Season with garlic powder and ground ginger. Boil until slightly thickened. Remove from heat and cool to room temperature. Assemble the teriyaki sliders. Slice the buns/rolls in half. Place a patty on the bottom half of the bun/roll. Pour a little teriyaki sauce on top. Cover with the other half of the bun/roll. Serve immediately. For tailgating, prepare the patties ahead of time and keep in a cooler between sheets of wax paper. Slice the buns and keep in its bag. Make the teriyaki sauce and put into a squeeze bottle for easy pouring. Grill the burgers and assemble on site. Teriyaki sliders may be made without the sauce. Garnish the patties with lettuce, tomatoes, onions and other condiments of choice. 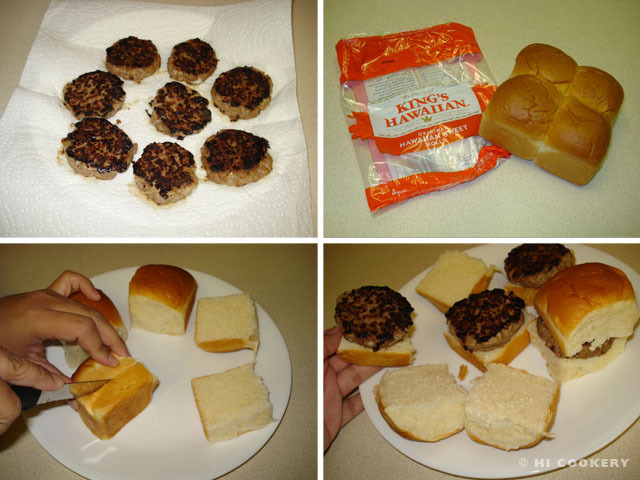 Supersize the petite patties and make them bigger to fit regular hamburger buns instead of rolls. 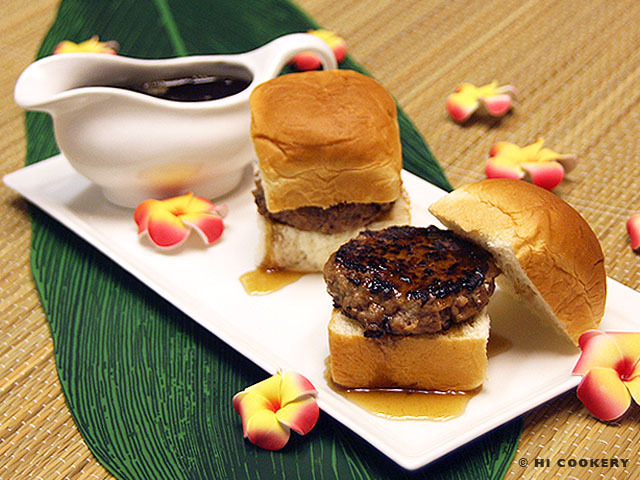 Mahalo (thanks) to Mary Ann B. for the cookbook featuring the recipe for teriyaki burgers which we adapted into sliders.